When the ad generated a positive response, the railroad developed an advertising campaign around the image and chose the name Chessie as a derivation of the railroad's name. The promotion proved widely popular and, in addition to national print advertising, grew to include calendars, clothing, and even two children's books about the character. Chessie's mate was Peake, who was introduced in the June 1937 issue of Life magazine and was the father of her two kittens, "Nip" and "Tuck". During World War II, the Chessie character was used to promote War Bonds and support for the war effort, depicted as working on the home front to support Peake, who was off to war. The Chessie image continued to appear in advertising until 1971 when passenger train travel was consolidated under Amtrak. 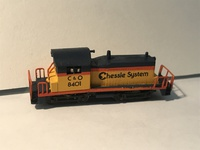 When in 1972 the C&O merged with the Baltimore and Ohio Railroad and Western Maryland Railway, the newly formed company was named the Chessie System after the popular image and adopted the "Ches-C" logo, which incorporated the silhouette of the kitten into the "C" of the railroad's name. 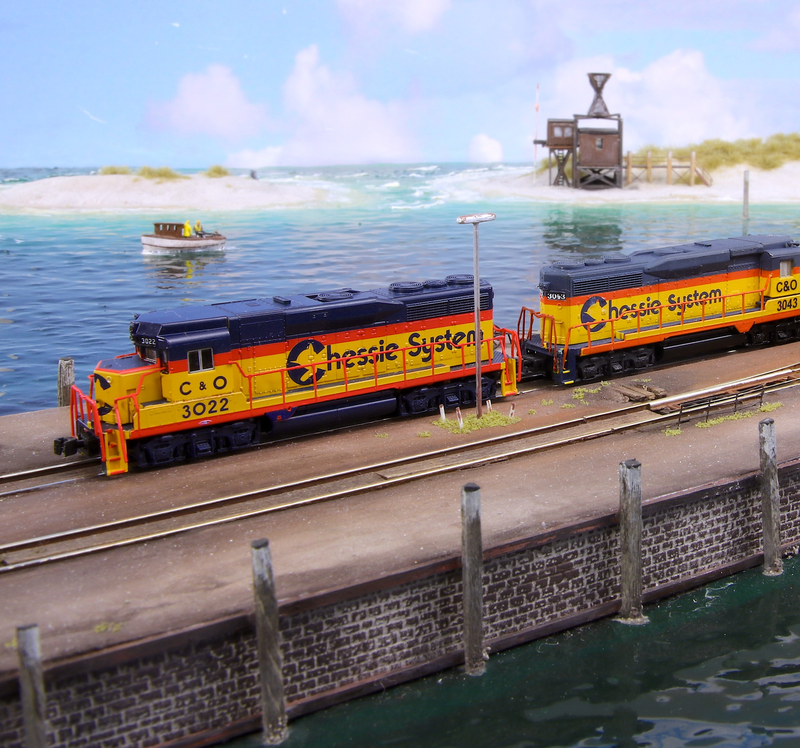 The Chessie System merged with other railroads to become the CSX Corporation in 1986. 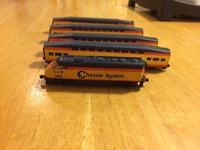 Though the Chessie logo is no longer found in advertising and was phased out of usage on trains, Chessie is still the mascot of the CSX Corporation, and there are many examples of rolling stock that still feature the kitten logo, having yet to be repainted. This is the string for all Chessie fans !! Please put your pictures, videos, stories, custom paints, layouts, depots etc. up here. 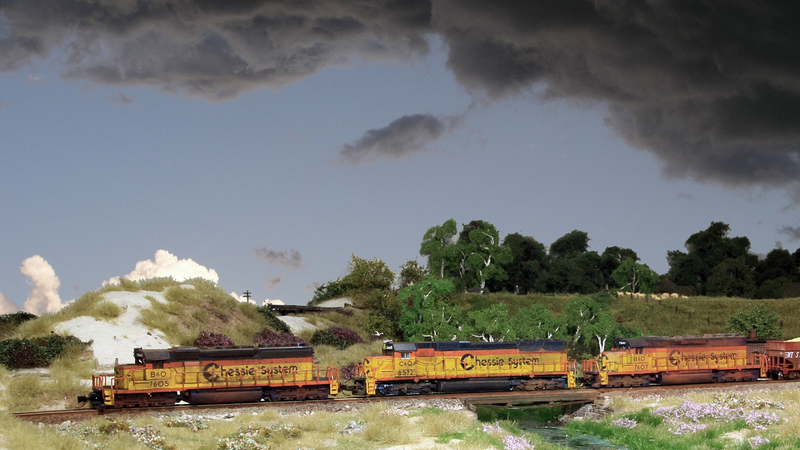 Two SD40-2 and a SD50 pulling a WM wood chip train !! In 1983, what was by then the Chessie System was looking for a way to downsize the tugboat fleet at Newport News while still being able to dock the new large colliers that were being built and calling at the coal piers. 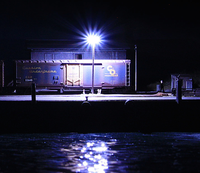 By then, the 1980 merger with the Seaboard System into CSX had created a new all-rail routing into Norfolk and Portsmouth from the former C&O Railway. Thus, the need for the cross harbor car floats was eliminated. The only job left for the tugs was docking and undocking ships. 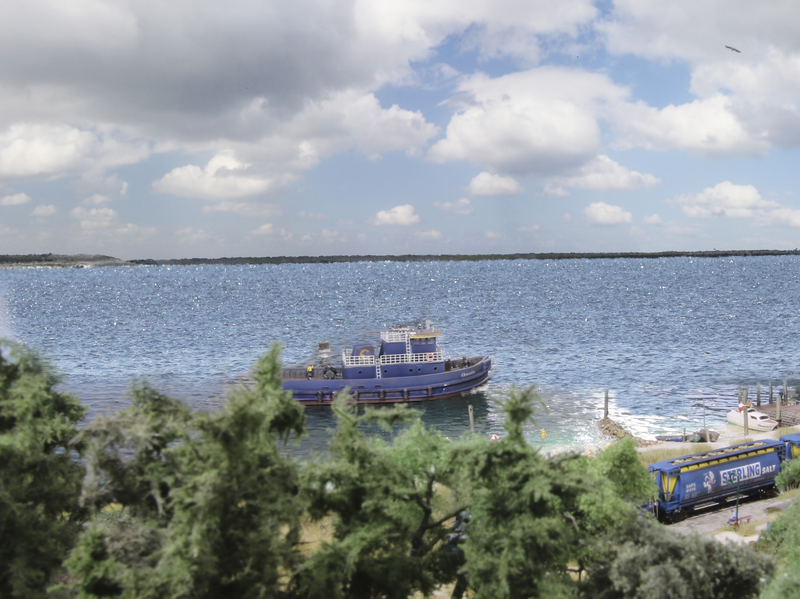 An order was placed with the Jakobson Shipyard of Oyster Bar, New York for two new tugs. They are among the most powerful tugboats ever built. Costing $3.3 million each, they were 105 feet long and had two General Motors diesels with 3,900 horsepower. At the request of and with financial help from Newport News Shipbuilding, the new tugs had twin screws and special thrusters called kort nozzles that enabled them to have greater thrust and maneuverability. 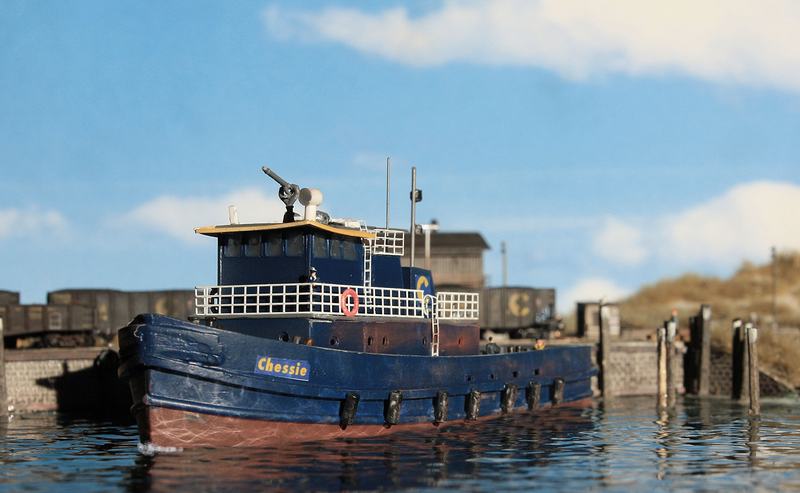 The new tugs were called Chessie (second) and Seaboard. 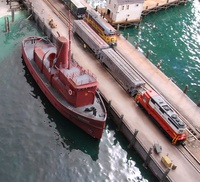 These were the last two railroad tugboats built in the United States. At the height of the tugboats usage in Newport News there were 124 men working on them. Each tug had three daily crews with up to six men on each crew. The car floats had a captain and a fireman and the house barges had a deckhand. The reason for the captain and fireman on the car floats was that they could be steered to assist the tugboats while docking and undocking at float bridges. The fireman manned a small boiler that provided the “power steering” to move the rudder. .... and out in the Bay! 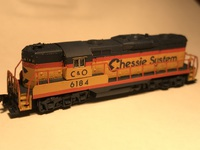 At the moment AZL only offers the EMD GP30 (62115) in the Chessie colors. Which you see here as the front engine on the mole - Chessie C&O 3022. At night, all cats are grey. Really? 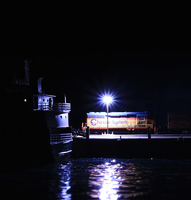 Did you notice the light in the one porthole window of the tug boat? Quite a Chessie stable you have there! Who made this lovely little loco? It’s a zthek my I put together and painted. I actually made a few of my own switchers out of brass too. But this isn’t one of them. You did a terrific job! I didn't think I had seen one in the rr marketplace 'cause I would have bought one in a heartbeat!